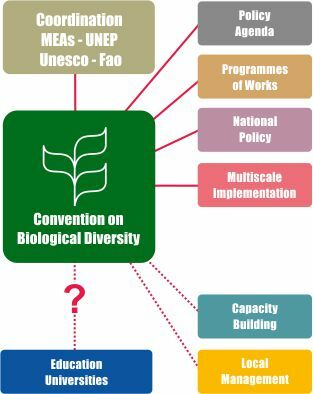 The innovative mission of the IUNCBD Network has been developed in response to the deep concerns expressed on the gap of coordination and knowledge between education and the International Conventions/Organizations that operate in the field of cultural and biological diversity. The IUNCBD Network aims at bridging the gap between academic and policy perspectives, between education and capacity building, between universities and the local contexts to which they belong. Communication, education, public awareness, capacity building and policy implementation processes should be integrated in a comprehensive, dynamic, long-lasting strategy and action plan that can really contribute to the implementation of the Convention on Biological Diversity. The International University Network on Cultural and Biological Diversity (IUNCBD) has been established under a Memorandum of Understanding and Cooperation (2010) with the United Nations Secretariat of the Convention on Biological Diversity (CBD). The initiative has a special focus on developing countries. Universities are of paramount importance because they play a key-role for capacity building and public awareness, which are the milestones for good governance and effective policy making.